Bring on fall! While I enjoy summer so very much, I am really looking forward to all the cozy opportunities the fall season brings. This weekend, I discovered that Starbucks’ fall line of beverages is out, which totally means fall is here! Have y’all tried the Salted Caramel Hot Cocoa? I treated myself to one on Sunday night and it is a super yummy indulgence. 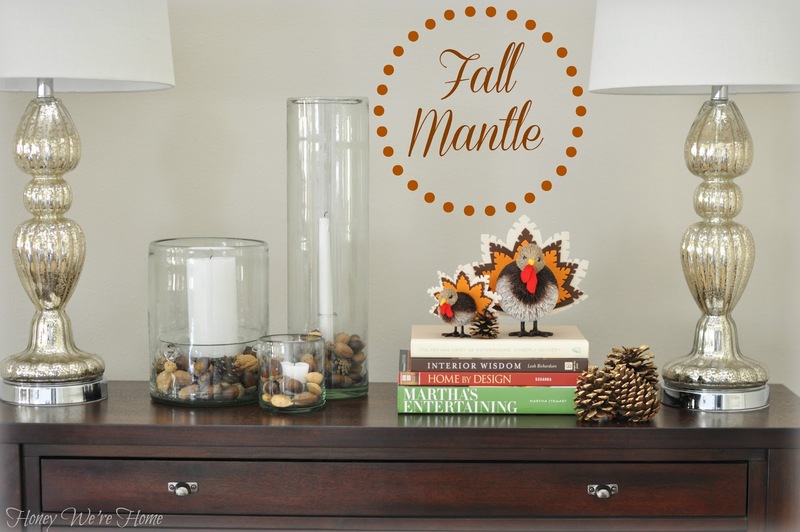 And on the home front, I tucked away the summer decor and decorated our “mantle” for fall. I dressed up a table too and will show you that soon. 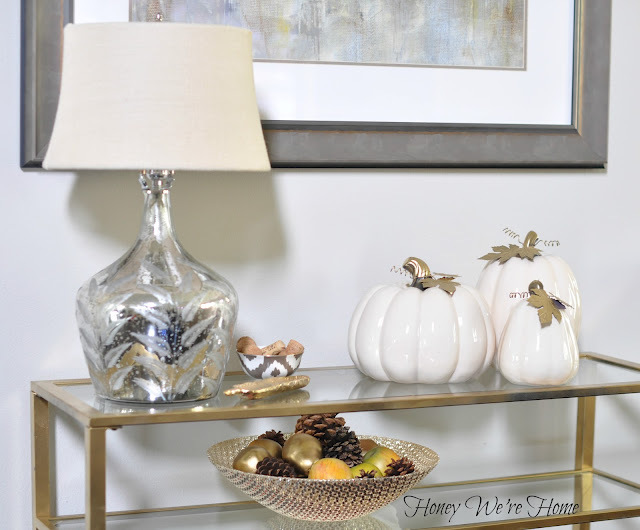 The mercury glass lamps on my mantle are from Home Goods (of course!). I added the Pottery Barn glass candle holders, which contain walnuts and acorns. 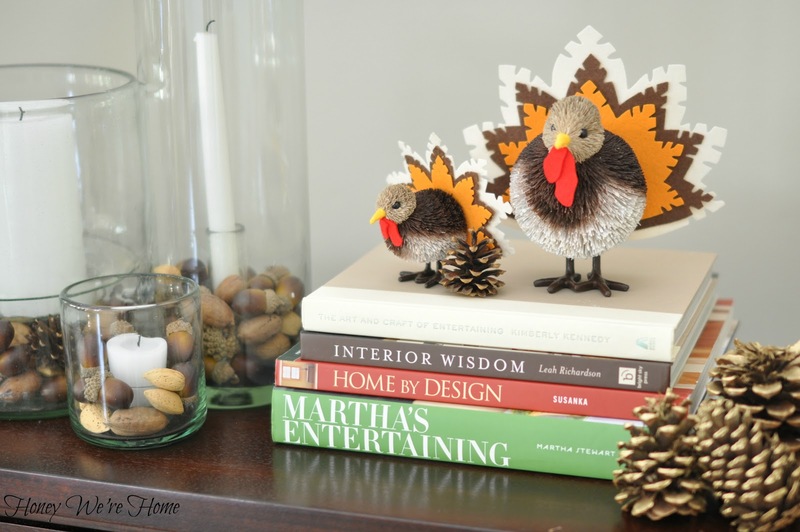 I love to use books in decor and chose these red, brown, cream and green books for their color and subject matter (interior design and entertaining) since fall tends to find us burrowing in our home even more. 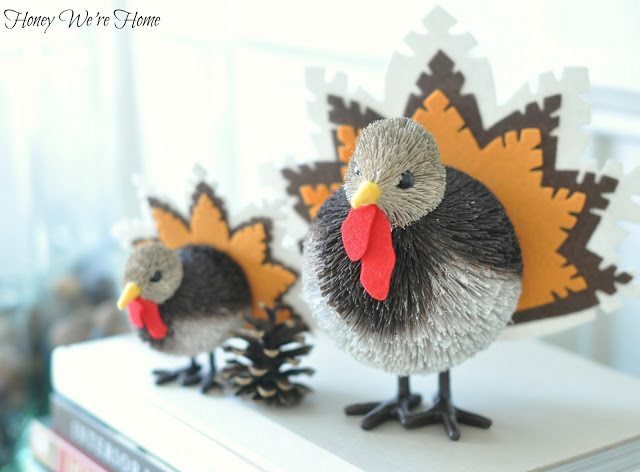 I’m crazy for these cute little crafty turkeys from Pottery Barn Kids. I got them last year and pulling them out again this year brought a smile to my face. And to me, pinecones are a delightful fall accent- especially when they are given a bit of gold spray paint. 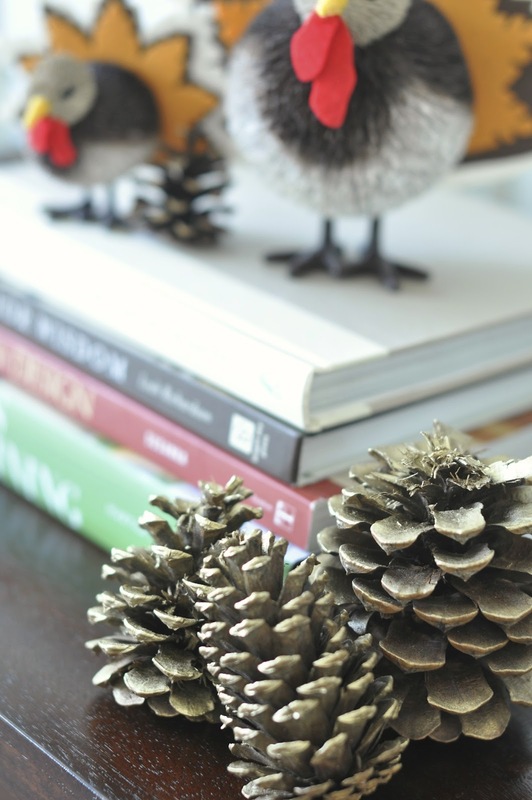 I’ve got pinecones tucked in little corners all over the house now. Actually burning the candles at night feels so good! We are pretending we have fall weather, but probably won’t see our temperatures drop significantly until late October/early November. Then, I couldn’t leave well-enough alone, and switched up the Fall Mantle a couple more times for a different look. You can visit Centsational Girl for more Fall Mantle Ideas. Thank you for entering the Quality Bath Giveaway! Oh, the little turkeys are adorable! Love this! I am now inspired to change my mantle! It's so funny that we get so excited about Fall but our weather doesn't really change for another few months. Changes are fun though and so are those turkeys. Even if the weather isn't Fall we can still celebrate it inside. I can almost smell the crisp air….until I open the door and am met with 100 degree hot air! 😉 Looks really great…love the PB candles. did you see my text?!?!?!?!? It's so pretty! Those little turkeys are darling. I'm so ready for fall! You're always so on top of the season changes! I'll be lucky to get some fall decor up mid-october 🙂 ha. We're the same as you though, it'll be quite awhile before it feels like fall outside! Love your fall display! I can't wait to start working on my mantle! I like the acorns and walnuts you added to your hurricanes! I've also started decorating for Fall even though it's still pretty warm here too. You should try the pumpkin spiced latte from Starbucks. Love it! The turkeys are especially adorable! 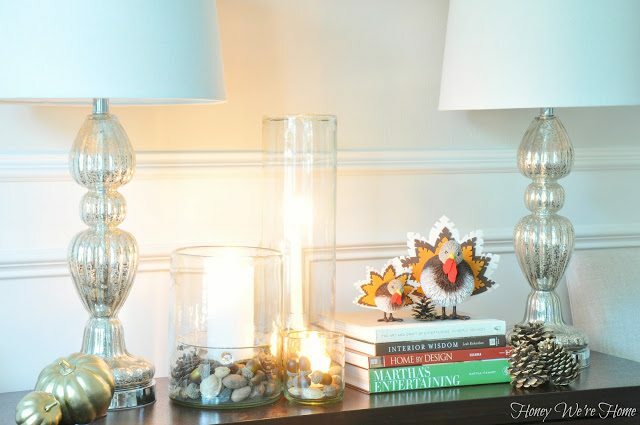 I need to start decorating for fall, so this gives me some inspiration (since it's still warm here as well). So calm and beautiful–the perfect combination. 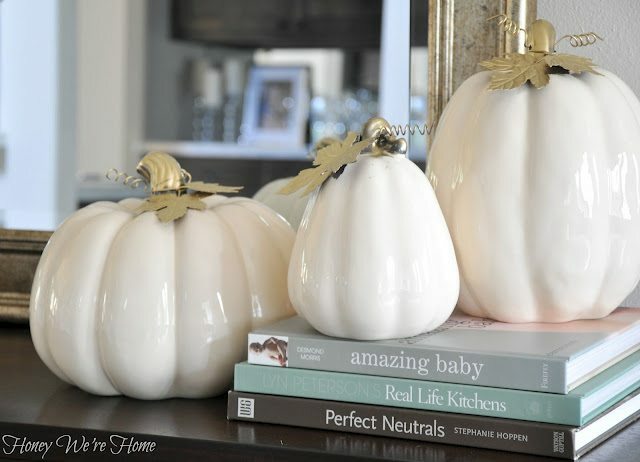 I just love your fall display, especially the cream colored ceramic pumpkins. Beautiful. I am visiting from Centsational Girl. 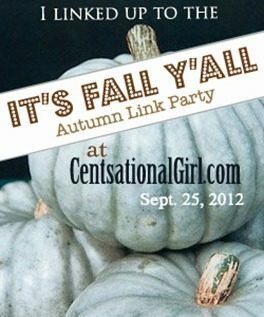 I would love for you to come and link up to my Fall into Fall party that opens tonight at 8pm EST. Hope to see you there. 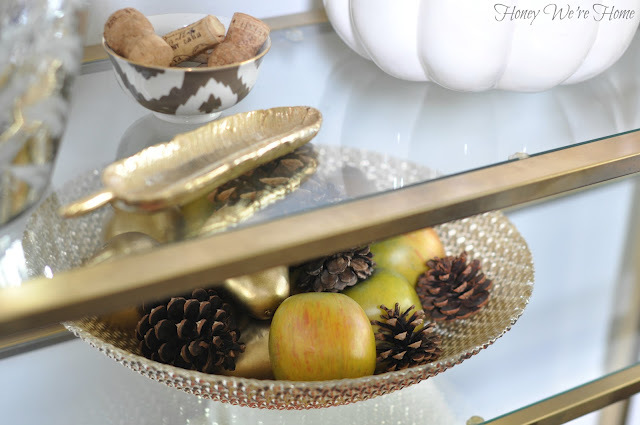 loooving that chevron ikat bowl and the gold/silver accents. gorgeous! wow! 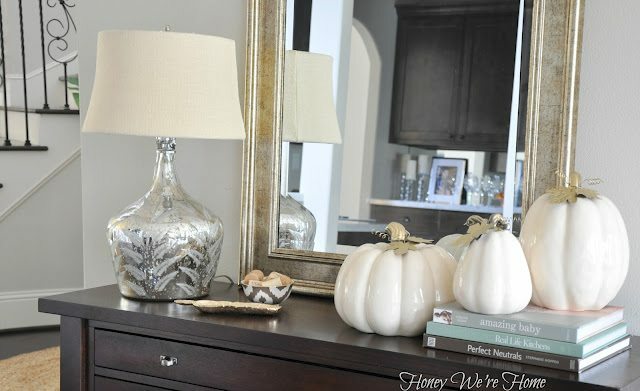 those white glass pumpkins are gorgeous!!!! Love the pumpkins! where did you get them?